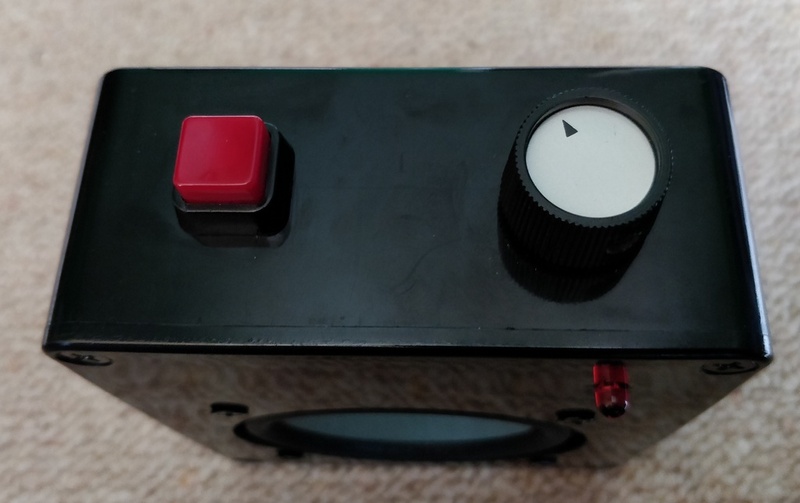 I've built many small speaker projects in the past - but I wanted to improve their convenience with this new project! Previously amplifiers built using class AB amplifiers (such as TDA2822, TDA7052) has operated at higher voltages, unless you can live with quite low volumes. Class D amplifiers are more efficient. The PAM8403 operates off of 5V and can generate 3W per channel. This is better than the TDA7052 which is around 1W at 6V. 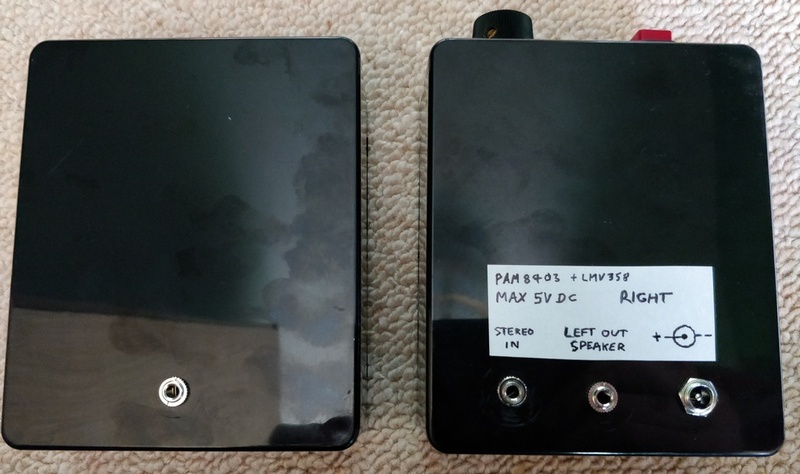 However, class D amplifiers are harder to DIY, and lower sound quality (except the good hi-fi versions), so for some projects I still recommended these simple chip-amps. 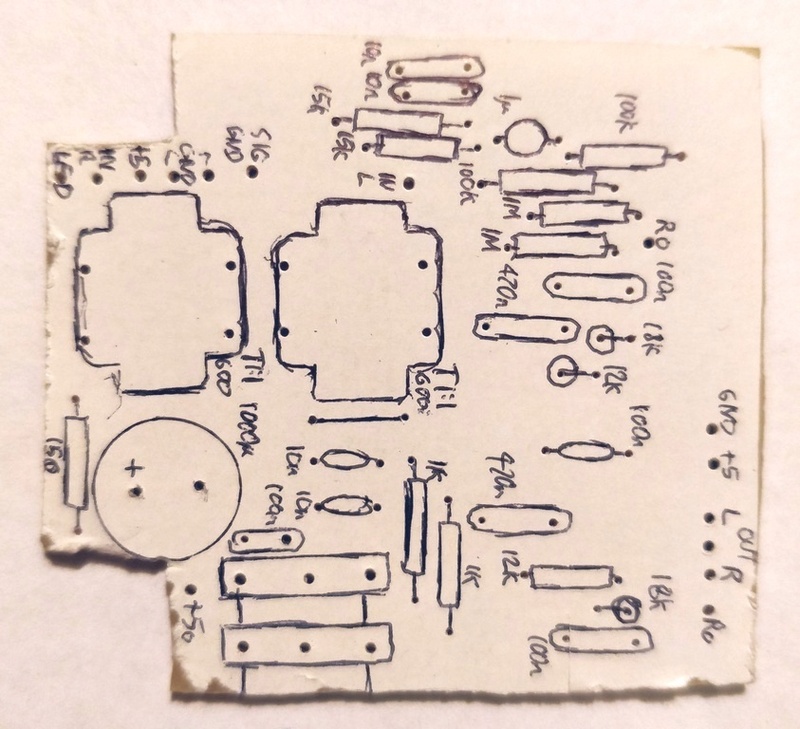 PAM8403 is a surface mount chip, and it's actually just far easier and even cheaper to obtain an assembled unit - such on eBay for example! I brought a few as they average just £2 each, shipped from somewhere in East Asia. 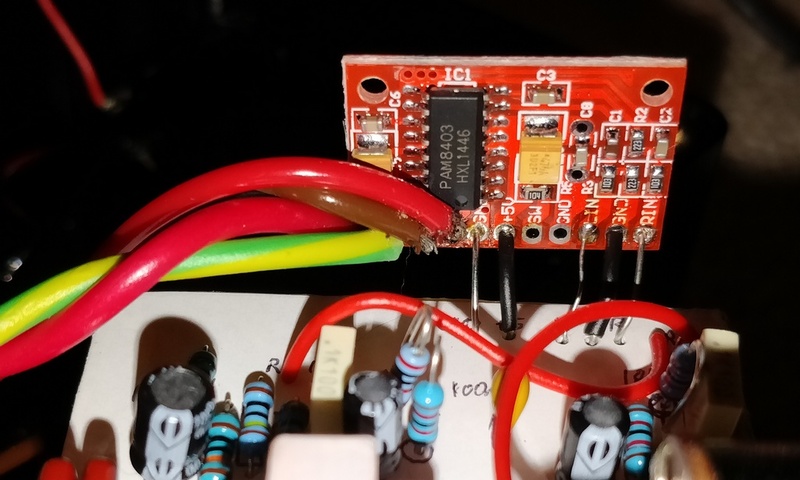 5V operation means this amplifier can be powered off a USB port. USB ports are common these days - laptops, phone chargers, TVs and even some hotels have them nearby. Three 1.5V cell batteries (such as AA or AAA) give 4.5V which is fine for battery use too, and they'll go for some time before going flat. I won't say much else except the PAM8403 is pretty good and very good value for a small DIY project. It is less 'DIY' though than soldering your own PCB together. Back in the past - my builds typically weighed a kilogram or more. This is because I'd use the best drivers I could find, from ghetto blasters to car speakers and/or use wood for the box. This improved sound significantly, but cost in weight. If travelling, particularly with a laptop, camera (and lenses) etc, having heavy speakers too is tough on the back! 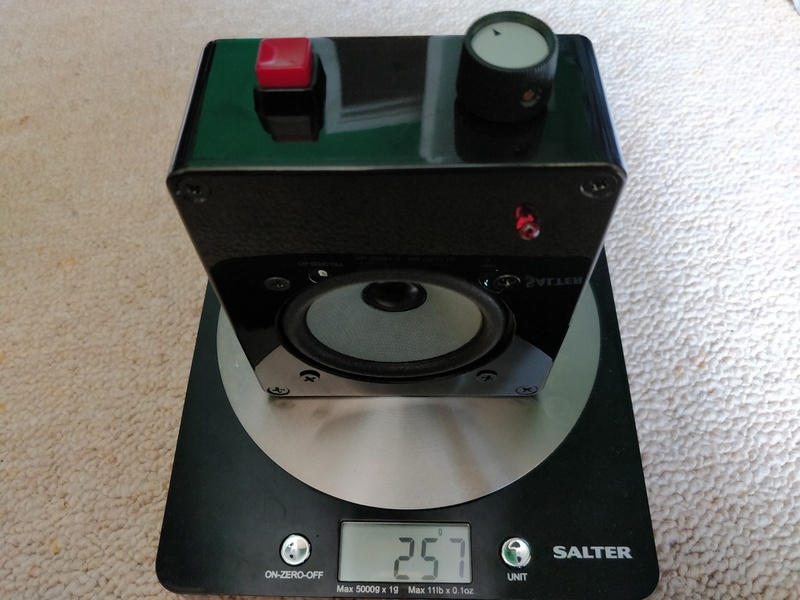 So, I decided to cut weight - to do this I would need to go for the smallest size boxes I could, use plastic, and search for lighter speaker drivers. 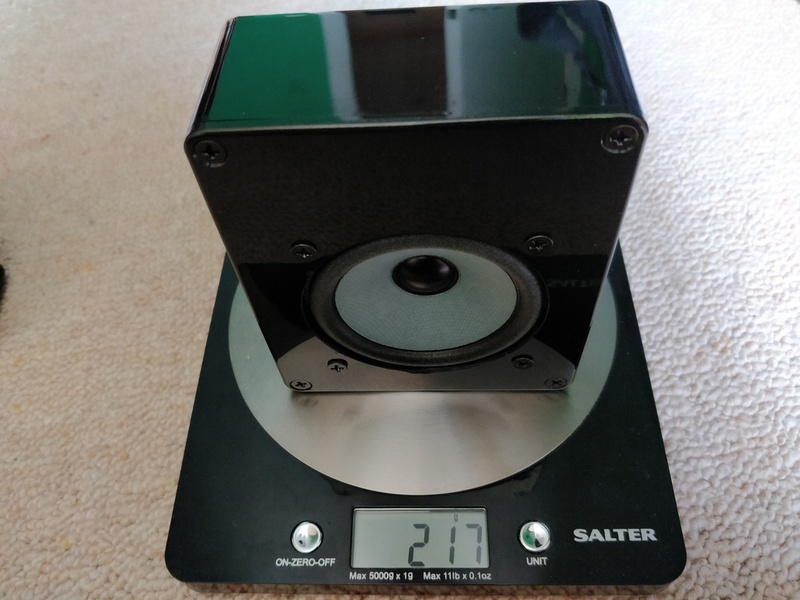 These days with sites like eBay and Amazon, there is more choice and you can find speaker drivers with Neodymium magnets, again probably shipped from abroad. Speakers with Neodymium magnets are lighter for the same power handling. I found a pair with about 3 inches of diameter, paper cone and fairly good frequency response, so used these in my build. In the past, my solution to this was to build bigger versions, using more substantial drivers. But the cost was always to portability. 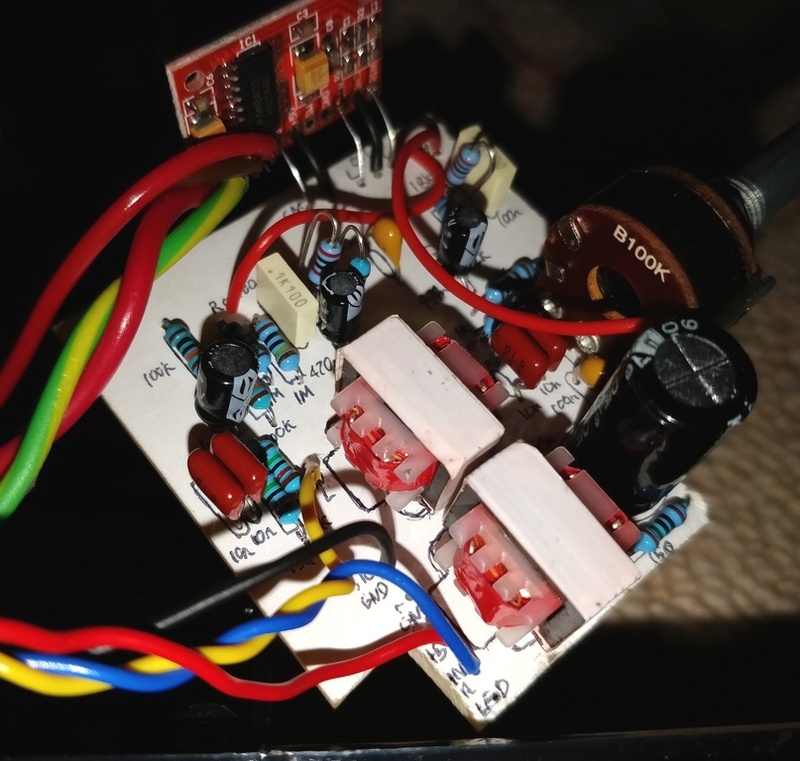 Based on my experiments and modern op-amps that can operate on low voltages, I created bass boost circuits which I've used so far three times. 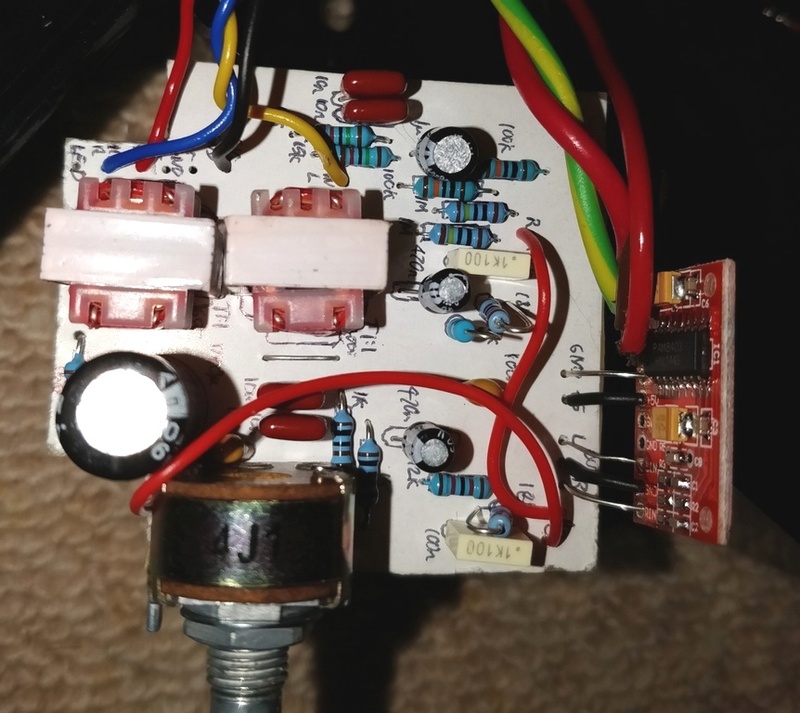 See my bass boost project page. For portability, I don't want to add a power supply or batteries for my speakers unnecessarily. Typically, my source will be a laptop - which is giving the 5V for power over USB, and also the audio from a 3.5mm headphone socket. This creates a problem though - the ground line is running from the both the USB port and the 3.5mm jack socket, giving a ground loop. With laptops being quite noisy devices for audio - this exaggerates the problem. It can be relived a little by adding a 10-20 ohm resistor on one of the ground lines (audio is best) - but still causes hiss, humming and/or scratching noises when you move the mouse or disk activity happens. This can be solved by using transformers. 600:600 transformers are common enough and work well for the job. When used on the audio input, they completely isolate the ground loop, giving a clear sound as transformers will only pass AC voltages, such as analogue audio. They're not perfect though, and audio response is not linear. Low frequencies will be lost a little, but for small speakers - this is OK. For hifi - I'd be more hesitant! 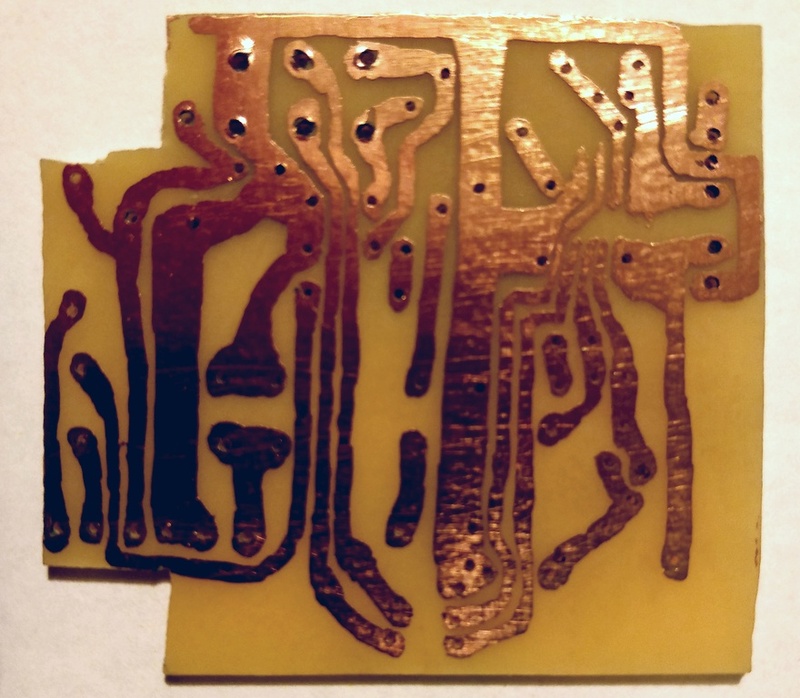 Whilst small, they do occupy quite some space, increasing the size of the PCB needed. You need two for a stereo signal. Having ordered some (actually 10 for £3) and giving them a try - I'd highly recommend them if like me you intend to power the speakers from the same source as the audio (such as a laptop). If you want to avoid them though and intend to use the speakers with their own power supply or batteries only, then give them a miss! To build these, I created a PCB to put all the components together. 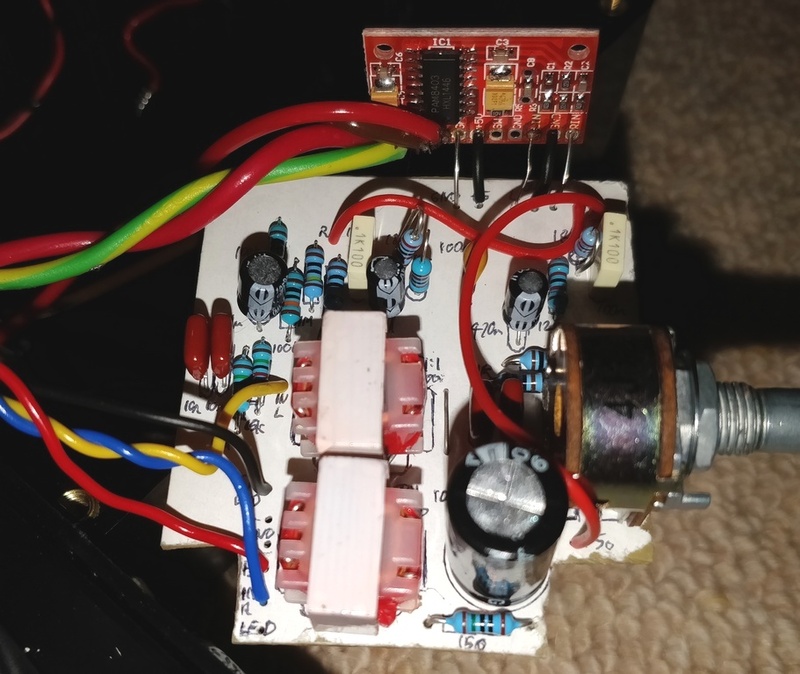 This PCB contains audio transformers to fully isolate the audio in, some power supply smoothing and the bass boost circuit complete with volume control and high/low pass filters. It also has a header to attach the PAM8403 board to. For those interested, I've included the design and photo of etched PCB underside below. Note that this design shows the transformers wrongly rotated by 90 degrees, a mistake I spotted later. I managed to design, cut, drill, draw, etch, markup and solder the PCB within a day. The LMV358 is on the underside and the most difficult part to solder. The following day I soldered wires, attach the PAM8403 board and tested the speakers. The results are quite pleasing! The speakers together weigh less than half a kilogram, run off a laptop's USB port, go quite load and sound pretty good. To be critical, they sound a little plastic - this would be mitigated by a thicker plastic box and some sound deadening inside. They'll win no prizes for looks, but as a quick construction and for their performance - I'm overall happy and take them with me whenever I travel. 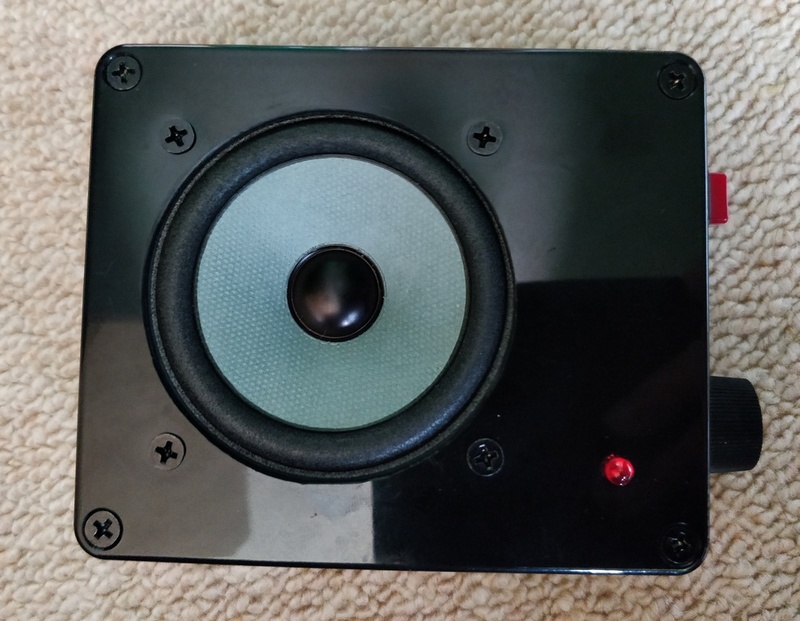 They are far better than laptop speakers, generally far better than built in TV speakers (particular small TVs in hotels), better than some commercial offerings I've heard and because there are two speakers, the stereo effect is pretty nice.